Overprepared: Looks like no rain is getting to Deneka Shile, thanks to umbrellas from the Museum Shop at the Museum of Art and History. Can we shop our post-election troubles away? Probably not. But no one is going to stop us from trying. In years to come, people will look back at the 2004 holiday season as the one in which shoppers took comfort in, well, comfort. Here in Santa Cruz, many shop owners said they were expecting the worse on Nov. 3 as Bush's (gulp!) re-election (waaah!) hit local residents like a well-aimed blow in the groin. But as Best of Everything owner Kamala Franseth reports, instead of people losing the taste for shopping, for many the reverse proved true. "We open at 10am each morning and by 10:30am that day we had sold four of our ultrasoft bathrobes. By the end of the day, the number was up to six. People were out and about and comfort shopping," she says. With those observations in mind, and cognizant of the long dark teatime of the soul, as Douglas Adams once put it, which half our nation appears to be currently indulging in, we humbly present our guide to local comfort shopping for the holidays. Dot Dot Goose: It's not always easy to pick from the Best of Everything. Since moving from its relatively cramped quarters on Walnut Street to the spacious acreage that Tiffany's formerly occupied, BOE has been able to display its uniquely eye-catching objets d'art to their best advantage. 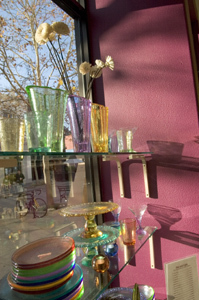 Take the Fire and Light recycled glassware that illuminates the store's front windows, even on not so sunny days. Or the concertina-styled vases which seem to defy the rules about not mixing paper and water unless you're trying to make pulp. Or the fabulous collection of silk cushions and pillows that add a touch of simple but elegant class to even the plainest room. If you're hoping to scratch someone's funny bone, consider BOE's humorous gift line, which includes Talk the Talk Without Walking the Walk slang or therapy flashcard greeting cards, or celebrity mug-shot playing cards. And don't overlook BOE's mock ice cubes, which could be the answer to shopping for your "on the rocks" uncle. Room to Let You Shop: Best of Everything has moved from its cramped quarters on Walnut Street to the spacious digs once occupied by Tiffany's. If physical comfort is what your giftee craves, visualize them lighting a devotional jazz candle with one of BOE's illuminating sticks, or setting lavender-scented floating candles into wax serenity bowls, as they slip into a soothing hot bath with a bar of Belle de Provence Olive and Mint Leaves Soap, before drying off with an Egyptian cotton towel, wrapping themselves in an ultrasoft Micro Fiber Chenille Robe, slathering themselves with Zents' line of unusually rich fragrances, and crawling in between 600-thread-count sheets, all the better to slip into lala land. OK, OK, so maybe they won't get quite that lucky with the gifts, but any of the above-mentioned items would be a great start. And if you have a kid on your list, what better than an enameled bicycle bell, or a percussion fish, frog or pig, especially if said child does not, we repeat, not, reside in your house. If, at the end of the day, you decide to treat yourself, the owl whistle seems like a good place to start, or you could invest in a resin orchid pot, which, we have on top authority, is the last word on keeping this year's orchids alive. Talk Ock: The octagon-shaped Museum Shop is not just a great place to look for holiday gifts, but one of Santa Cruz's architectural gems, as well. 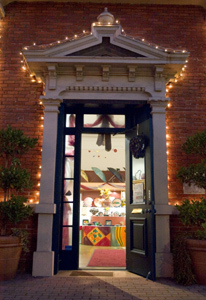 "Men like this store", says Museum Shop manager and buyer Sandy Kurz, and we can see why. Full of practical as well as whimsical gifts, the octagon-shaped store is first and foremost an architectural gem in an era where buildings in this town are increasingly box-shaped. Inside this aesthetically comforting structure, you'll find an absolutely fabulous collection of umbrellas, including ones from the Van Gogh Museum in Amsterdam and silver and black oversized umbrellas from Italy, which Kurz describes as "very black tie." And then there are the adorable kids' umbrellas, which come in ladybug, cat or frog. 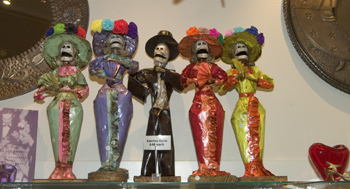 Dead Again: It's never too early to stock up for next year's Day of the Dead at the Museum Shop. Home to the best collection of bird mobiles in town, including great blue herons, pelicans, snowy egrets and hummingbirds, the Museum Shop carries great stocking stuffers and office gifts, including mouse pads woven in Istanbul, indispensable taxi wallets, Morrocan leather piggy banks and artsy block puzzles for the CEO in your life, as well as Escher lizards, moleskin pocket weekly diaries and Lesbian Pulp address books for your local version of Lynne Cheney. And then there's the museum's infamous coaster collection, including the Toothy Frog coaster and bottle opener, which, as Kurz puts it, "is perfect for anyone you know who drinks imported beer." The store also features a fabulous collection of jewelry, playing cards, kids' toys and books, hand-painted pepper mills, vases with attitudes, hand-cut pop-up Christmas cards and ornaments from Robert Sabuda, including a snowflake, a reindeer and a dove. And for the person who has everything, how about street banner totes, a grass picnic blanket or, of course, the indispensable celebrity rag dolls, including Frieda, Che Guevara, Virginia Woolf and Karl Marx? Everybody Nose: At Perfumer's Apprentice, anyone can create their own unique fragrance. Bulgarian rose. Oak Moss. Patchouli. Roman chamomile. These are just a few of the many natural essences you'll get to sniff and mess around with at Perfumer's Apprentice, the newly opened gem of a store tucked above Ambrosia Cafe and far from the madding crowd. Perfumer's Apprentice owner Linda Andrews says she could never handle perfumes--"They gave me headaches"--until she took a workshop with master perfumer Mandy Aftel and realized that her real problem up until now had been synthetic scents. "For the last 80 years we've been subjected to synthetics, so people forget what frankincense and rose really smell like," says Andrews, opening a bottle of labdanum, a dark resin obtained from citrus bushes which was reportedly once carried across the desert on camels, because it was so highly prized, and which smells of earth, baseball gloves and Grandpa's jacket. "Our sense of smell is the most basic. It bypasses the upper brain, which is it why it's hard to find words to describe scents," says Andrews, recalling how one man, on smelling frankincense from Somalia, was yanked back to memories of being a choir boy. Andrews, who wants to bring back essences which perfumers have used for thousands of years, observes: "Natural essences are so complex, they hit people in ways synthetics cannot reproduce." True, as you'll soon discover, if you take up Perfumer's Apprentice on its staggeringly reasonable $10 package, in which you (or your giftee) get to spend an hour or so creating your own fragrance, by sitting at one of Andrews' wooden perfumer's tables, sniffing your way through a large collection of essences, before mixing your own fragrance, which you then get to add to any one of Andrews' products, including exfoliating hand, body and foot cream, and anti-wrinkle rejuvenating face cream. For an extra $5, you can experiment with an even wider range of essences, and if you want to put an extra fancy gift touch to your resulting fragrance, you can purchase a bottle-blue or gold-tinted pocket watch, locket or bottle. And did we mention that tea and cookies are served throughout? "This is the real deal," says Andrews. "You're not gonna find bubble gum scent here. You're going to access essences used by professionals. You can make your scent as light and heavy as you want. This place is all about having your own way." 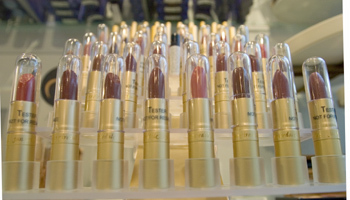 Our Lipsticks Are Sealed: Sky Meadow is standing by with a licensed cosmetologist. Just as the hard truth hits you that it's not that easy to relocate--and why the heck should you, anyway?--along comes Sky Meadow Apothecary to whisk you away to a universe where American supremacy is not the dominant theme. Founder Deborah Schachtan has decorated her newly opened store in soothing sky blue and meadow green tones, outfitted it with miniature Eiffel Towers, birdbaths and opulent displays of pomegranates, and stocked up on gorgeous smelling items. The result? Stepping through Sky Meadow's doors is like landing on a foreign shore without the agony of permanent exile. With a table wood lamp skin scanner on the premises, along with a makeup artist and licensed cosmetologist on the staff, Sky Meadow provides professional skin-care advice and professional product lines (Aesop, Jurlique, Enzo, Wen, etc.). And then there are the "Watch out, Starbucks!" Elixir tonics and teas, which are concentrates of berries and fruits enthused with Chinese herbs, and come with names like Depth Recharger, Liquid Yoga and Mind Over Muddle. 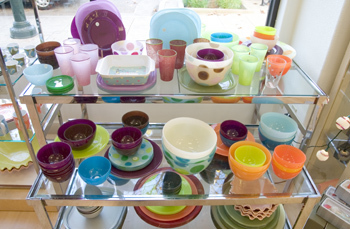 Sure, it's hard not to pamper yourself in this store, but for the disciplined shopper there are plenty of fun-to-peruse options. Fondle the olive oil-based soaps from Turkey, Jordan and Greece. Connect with the exfoliating body brushes and linen mitts from Ireland. Sniff the sea salt and tomato-leaf bath salts and candles. Swoon over the rose-shaped soaps in silk pouches. 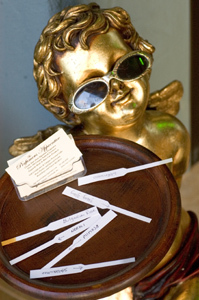 Inhale the mimosa-fragrance soaps from the south of France and flakes of Savon de Marseilles. Take comfort in the Japanese quince candles, which come ready made in pagoda boxes with little gold tassels, taking the pain out of the gift wrapping. Or invest in one of Dawn M. Spencer Hurwitz's amazing perfume collection boxes. And let's not forget about the babies in our lives, who'll delight in Marla's Apothecary's massage oil, nappy cream and baby sandman aromatherapy and will surely look dangerously cute in one of Tubbies' little hooded towels.